“Our philosophy here at The Goddard School is all about play. We believe that children learn best through spontaneous exploration of their environment. When it came time for an addition to our school we found ourselves questioning the appropriate play ground for this new space, since we already had a traditional playground in our original building. 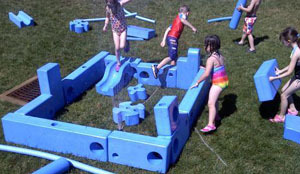 We know that kids are attracted to colorful play structures and slides, but the stationary playground structures offer little room for imagination and creativity. We really felt that it was important to find something that would encourage the kids to run freely and to create their own games and fun. 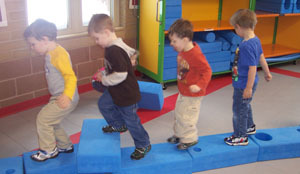 We have been thrilled with Imagination Playground™. This amazing model contains movable parts so that children create and build their own unique playground every day, tear it down and start again the next day. Thus, the play area never looks the same from day to day. Kristina and the staff at the Goddard School have discovered the limitless bounds of a child’s imagination through Imagination Playground™. Play it forward today so we can help bring Imagination Playground™ to kids across the country.